One of the many advantages of playing the pokies online instead of in a land based casino or pub is the lenient betting options catering to all players, making games more affordable. We take a look at some of the best low-stakes pokies games and the best online casinos for recreational punters. What is a low-stakes pokies game? Low stakes pokies are the more affordable online games, where the bet placed on each spin won’t put a huge risk on your wallet. Naturally, all gambling should be done responsibly and you should always bet within your personal limitations, but low stake games allow recreational bets without detrimental ramifications. Low-stake slot games start from as little as one cent per spin, so even if you only have a few dollars to bet with, you can still enjoy the entertainment factor of playing online pokies, and the excitement of possibly turning a few cents into a few dollars. While the Internet is a hot spot for high-stake gamblers, the more recreational players will find plenty of low-stake options for placing smaller bets, while still enjoying the chance to win real money. Are low stakes games worth it? A big misconception about the pokies is you have to bet big to win big, and while this is definitely true in many cases, it doesn’t always apply when playing online. Many of our favourite video pokies games can be quite lucrative even when low wagers are in place. We’ve even heard of incredibly lucky players winning huge multi-million-dollar progressive jackpot pokies with a bet as low as $0.20 per spin. If your intentions are striking it rich playing low stakes pokies, it’s important to be aware your chances are pretty slim. Many low-stake games mean you’re only activating one payline out of a potential 40, so your chances of hitting a winning combination are a low lower. Also, be aware some online pokies require the maximum bet to be in play in order for the games jackpot to be won, so if you’re playing the minimum wager hitting the jackpot won’t be possible. Low stakes games are definitely worth it if you’re looking for a little thrill to your day, and just want to zone out and potentially win some real cash. Playing the minimum bet also allows you to try many different real money games while stretching your bankroll further, and with thousands of fantastic online pokies available at our recommended casinos, low-stake games gives you the chance to try more titles. 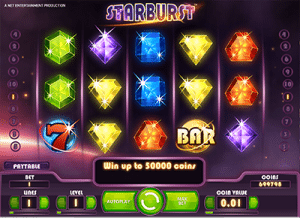 Starburst – one of NetEnt’s most popular pokies is also one of the most affordable, with bets starting from just $0.01 per spin when only one of the possible 10 paylines is activated. This simple yet highly attractive game is ideal for lovers of social media games like Bejewelled Blitz, as the reels are filled with gleaming gems of different shapes and colours. The addition of the Starburst wild symbol means your low wager has higher chances of rewards. High rollers can also enjoy the lenient high stake bet of up to $200 per spin. Avalon – Microgaming’s original Avalon pokies game caters to the recreational players with a low minimum bet of just $0.05 per spin. 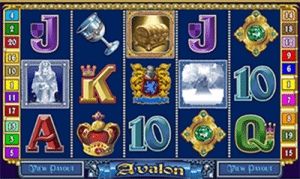 Avalon is an old-school, fantasy themed game, and one of the longest running Web pokies available. 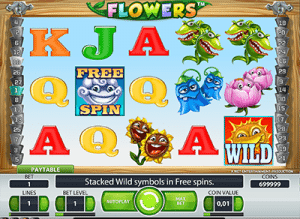 Free spins, scatters and wild symbols will help boost your winning potential. If you want to try the more impressive and more popular follow up game, Avalon II, you can still do so without breaking the bank, with minimum bets starting from $0.30 per spin. Blood Suckers – this is a slightly older NetEnt game which remains highly popular thanks to its cartoonish vampire theme, which is equal parts creepy and fun. Bets start from just one cent per spin when only one payline is activated and you choose a coin value of 0.01. 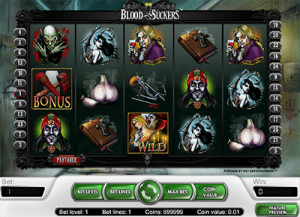 Playing one payline for the minimum bet will lower your chances of triggering the bonus game where you get to stake vampires through the heart for additional wins, but it can be done. There’s also scatter and wild symbols to help boost your winnings along the way. Safari Sam – given the high level of 3D animation which goes into BetSoft’s Slots3 collection it’s somewhat astounding these games are so affordable. 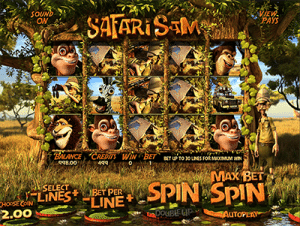 Safari Sam, like most of BetSoft’s 3D pokies, starts with a minimum bet of just $0.02 per spin, although be mindful you’ll need to activate all 30 paylines to with the maximum amount. Safari Sam uses an awesome African safari theme, with reels packed with three dimensional, cheeky animals and images of the safari life. There’s a bunch of bonus features, including wild animal free spins, scatter pays, random wilds, safari bonus game, stacked collapsing wins and a gamble feature which gives you the option of risking each win for the chance to double your winning amount. Flowers – Net Entertainment sure knows how to nail a basic game which manages to be both affordable and engaging, and Flowers is the perfect example of this. It’s vibrant, light hearted and uses beautiful, fun animation while also being suitable for all bankrolls. Low stakes players can play one payline from as little as $0.01 per spin, or activate all 30 paylines for just $0.30. Free spins and wild symbols add to the winning potential, while high rollers are also taken care of with a maximum bet of $150 per spin. The games outlined above provide just a tiny insight to the low-stake pokies available at our recommended casinos, with hundreds of other affordable slot games starting from $0.01 to $0.30 per spin. Games at our endorsed sites can also be played for free, so if you have limited funds you can still play in demo mode, which also gives you a good chance to decide which game you like the most before having to bet your own money. The affordability of online pokies is just another reason why players should consider making the switch from land based venues, with online vendors catering much more to players with smaller bankrolls. We recommend checking out Raging Bull Casino, our top-rated low stake casino site for players from United States, which has some excellent welcome bonuses available for new players and bets starting from $0.01 per spin.